The February 13th, 2019 Hamilton Southeastern School Board meeting was one of the longer meetings. This meeting had a number of topics covered including the video retention policy, an update to the non-discriminatory policy, approval of a bond, approval of a contract, and then updates by the superintendent and board members. In this short blog post, I’m going to cherry pick ten items from the meeting that were interesting or might make you say “hmmm…..”. The topic of streaming and retaining videos is one that I believe to be a no-brainer. Other districts retain videos of the board meetings and don’t indicate any date for them to go away. Other organizations do the same. As such, it is mind boggling that the topic was brought up again and nearly 30 minutes spent bantering it around before a vote was taken. At one point Mr. Boyer even commented that there were more important things for the board to be talking about than this, yet he continued to talk about this instead of calling for a vote! Look for this to be reviewed and hopefully finalized in next month’s meeting! Wow! A couple of community members, including to FHS students, spoke on alleged sexual harassment at Fishers High School and the idea that a person was being allowed to participate in a sport they were removed from as a result.This discussion by itself is enough to make you go “hmmm….’. It left many questions. You can watch the following video starting after about minute 12:00 to hear the comments. With the exception of Mr. Boyer, the board did not comment on this topic. It is an unusual thing for a student to present to the school board in the main part of the meeting. As such, the two FHS students presenting (in my previous “Hmmm) deserves its own call out. The bigger “hmmm”, however, is hearing a Fishers High School Student stating that as a result of the school district’s actions they don’t feel comfortable reporting future issue such as the one discussed. This is the exact opposite of the environment the school district has been trying to create. Hmmmm…. Most people likely missed the subtle comment made by Mr. Harrison, one of the technology people for the district. The board was presented with a contract that included a charge of over $10,000 for electronic equipment to add close captioning in real-time to the video streaming. It is odd that time was spent for the school board to discuss this topic because Mr. Harrison made the comment that it was in his 3 year plan to buy the hardware anyway. Hmmmm…..
On the draft agenda from the January 30th meeting, there was an item (5.01) for Ms. Chavez to report on a policy. Ms. Chavez prepared a 15 minute report to present to the school board on diversity. In the agenda for the February 13th meeting, this was dropped for a standard item on policies and Ms. Chavez was shifted to speak as a community contributor, which is restricted to just 3 minutes. I’m not privy to the details of what was promised by the board, but do see the draft agenda on the January 30th Board Docs and the final agenda for February 13th. Ms. Chavez did her presentation in 3 minutes, which was impressive. Wondering what additional information she could have presented will may you go “hmmmm….”. Just when you think it is done, it’s not. While time is running out. the administration opened up a survey to try to determine the impact of adding transportation. Adding shuttle buses between the two high schools is being considered, which would allow families that can’t afford to provide their own transportation to be able to still make a choice on which High School they want their child to attend. It seems high school choice is not yet completely nailed down…hmmm…. Southeastern Elementary will be opening next year. With a new school, you’d expect that the district would see an increase in the number of overall classrooms and thus an increase in the number of teachers. In addition to 26 new positions at Southeastern Elementary, there is also a need for teachers at other schools. Specifically, Cumberland Road would need to gain 4 teachers, Sand Creek Elementary needs to gain 1, and Riverside Intermediate needs to gain 5 teacher. A total 0f 36 positions need to be filled in the lower grade levels. A flow chart was created (shown below) to make sure that the hiring for these positions is equitable across the schools. Teachers in the district had until February 25th to apply for these Kindergarten through sixth grade positions. After that, the positions will be opened for consideration outside of the current teaching staff. this expanded opening is expected to happen by Spring Break. At the meeting, it was stated that there was going to be a lot of movement of teachers across the district. Mr. Boyer asked the question of how many positions the district was going to lose at existing schools to make up for the new school. The response was that the 36 open positions, replace 36 existing positions. No new positions are being created even though a new school is being filled. That should make you go hmmm….! Yes, you heard right. There could be another redistricting within a couple of years. This topic was raised when issues around High School Choice were raised and the need to consider different high school lines. If Durbin Elementary is updated or rebuilt, then it could take on a couple hundred additional students. This would cause a small shift in the redistricting that just occurred to take advantage of the space. The shift in the elementary schools would then roll out and impact the other schools that were being fed into. Changes to Durbin Elementary could happen within just a couple of years. Dr. Bourff seems to be pushing for this change sooner rather than later. Hmmm….9: Posting recent videos…Maybe Not? Previously it had been indicated that meetings in the new board room were being recorded and could be made available. At this meeting, it was stated that the board meetings that were being recorded before the streaming starts, might not be posted to the public. It was indicated that there would be a cost associated to getting the videos posted due to the need to add closed captioning and processing them to fit within the BoardDocs agenda structure. The technology group was going to need to see what the cost and effort is going to be. This would mean that some of the contentious meetings such as this one and the mid-November meeting would never go live. Hmmm….how convenient. It was stated by the board that the meetings are in the public, not with the public. This is important for those attending school board meetings to understand because it means that while you might have information that could help the board in the discussions they are having, you can’t share that information. It also means that if you want to speak, you have to request time in advance and present without the expectation of getting feedback. This means you can present questions, but you cannot expect answers. As many people saw in the February 13th meeting, the board can engage with members of the public if they want. They don’t, however, have to engage with everyone that takes the time to present. The February 13 HSE School Board meeting was definitely interesting. My notes are not perfect, but they give you an idea of just some of the many topics that were covered. Not all school board meetings are as exciting as this one, but with everything happening in the district, I expect there will be a few more exciting meetings in the coming months. I attended the December 12th, 2018 Hamilton Southeastern Schools Board meeting. This was expected to be an interesting meeting because the board was to approve the redistricting plans that had been developed over the previous months. Additionally, it was to be the last official board meeting for three of the seven members whose tenure ends at the end of the month. I attempted to capture video of this meeting; however, I had limited success. I worked with a new camera, so while the video quality is better than the cell phone I’ve used in the past, I’m clearly still learning to use the camera. Additionally, I can’t control the audience around me, including the tiny kids that had been brought to the meeting that were right behind me. The first option Dr. Bourff presented as a change to the proposed redistricting plan was to move Logan’s Pointe from Southeastern elementary School and HIJH over to Durbin Elementary School and Fall Creek Intermediate/Junior High. This only impacted 19 students. This proposed change was passed by the school board. The second option for change was to move Sunlake apartments to Harrison Parkway, and the “River” neighborhoods to New Britton Elementary School. This proposal had received a lot of discussion. This proposal would have put the “River” neighborhoods back into New Britton. The irony is that Sunlake kids would likely have to drive past New Britton to get to Harrison Parkway once the construction on 37 starts. This proposal failed to pass. A third option for change was to move the Anchorage neighborhood from Geist Elementary School to Brook School Elementary School. This proposal only impacted 6 students that currently attend Geist. This proposed change was passed by the school board. 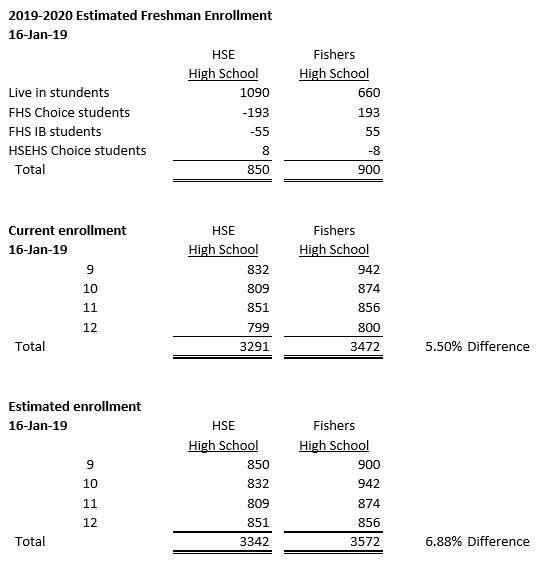 The fourth and final potential option for change in the proposed redistricting plan involved removing the 8% split that occurs at HIJH for students going to Fishers High School. This proposed option failed to pass by the school board. After the community talked, the school board members discussed the recommended redistricting plan and amendments. A final vote approved the redistricting plan with amendments to move Logan and Anchorage back. There would also be grandfathering for grades 3, 5, and 7; however, transportation would not be provided. Amendments to move Sunlake apartments was not approved, nor was eliminating the split at HIJH. An additional proposal to move allotments 131/132 in the Durbin area also failed to pass by the board. There were several other items that were covered in the school board meeting. A proposal was made and approved to move the school to a third-party audit system instead of using the Indiana State of Accounts system. An audit committee was brought up and approved in the previous school board meeting. Also covered was an update on live streaming the HSE School Board meetings. It was stated that the school board meetings would not start streaming in January. It was stated that the school system is required to include closed captioning on the video. This was not seen as an issue. The delay was indicated to be a result of using an out-of-state company of the video streaming. This company needs to file to do business in Indiana, which will take time. It is expected that February or March is more likely to be a start time for streaming. Nothing new was stated on the 45-day retention policy. I will, however, try to record any meetings I attend and post them on a YouTube Channel for long-term retention (Fishers, The Other Side of the Tracks). New high school courses had been presented in the previous school board meeting. The courses were presented again and approved. The courses include African Studies, International Relations, Language for Heritage Speakers, Painting III, Robotics Design and Innovation, and Science Research (Independent Study). Several other topics were covered in the board member reports. The big topic, however, was the recognition of the three board members that were ending their tenures. Terry Tolle, Matt Burke, and John DeLucia will be leaving the board at the end of the month. Each of these guys brought their individual perspectives to the board. While Terry tended to be focused on beating Carmel, all three seemed to be looking out for the Kids in the district. Each contributed positively to making HSE Schools the best they could be. Losing these guys is a loss to the school system; however, hopefully those joining the board will fill the gap with fresh insights and perspectives.